Heritage Park is a medium sized, 55+ active adult community located five miles north of downtown Sacramento in the North Natomas area. With 965 homes divided among three gated villages, Heritage Park makes retirement in a sunny environment a reality. Residents of Heritage Park cherish the combination of living in an intimate setting while still having access to world-class amenities and an active lifestyle. Since Heritage Park is located just off I-5 and only about 15 minutes from downtown Sacramento, it offers the best of both worlds: a tranquil living environment with easy access to shopping, restaurants and nightlife. However, residents of Heritage Park may never want to leave as the community offers a wonderful variety of amenities including a beautiful clubhouse, indoor and outdoor pools, and relaxing community spaces. At the heart of Heritage Park in Sacramento is a 25,000 square-foot clubhouse. The business center located within allows people to stay connected. A large library and theater keep residents entertained. For social events, the Heritage Park clubhouse also contains a ballroom as well as a comfortable pub. A large living room allows for relaxing with friends and neighbors. A fitness center, aerobics room, and indoor and swimming pool provide activities. While the clubhouse is the heart of this planned community, the five one-acre parks make up the soul of Heritage Park. Each park offers different activities. Tennis, basketball, and volleyball courts provide popular activities as is relaxing next to the outdoor pool. For further amusement, there are horseshoe pits and areas for badminton and bocce. Wonderfully landscaped gardening plots allow for satisfaction of nature's beauty in between activities. Tree-lined walkways with plenty of room for biking connect each neighborhood and beckon for enjoyment of the California sun. Gazebos, fountains, and strategically placed benches allow for reflection and recharging. Heritage Park offers a large variety of floor plans with low-maintenance landscaping in single-family and duplex style homes with low association fees. Most homes are one story, but there are some two-story houses available. Heritage Park offers four collections of homes: Coastal, Caribbean, Riviera, and Martinique. Homes in Heritage Park range from a cozy 1,087 to a spacious 3,264 square feet. Heritage Park homes feature two to four bedrooms, one-and-a-half to three bathrooms and a two to three-car garage. Most homes also feature a den that can be utilized as an additional bedroom. These houses were built between 2003 and 2005, so even the most affordable ones will have many upgrades. Heritage Park is a 55+ community offering an exciting lifestyle. A full-time activity director is available to make sure no one will ever run out of things to do, even on rainy days. An on-site hobby and game room provides arts, crafts, and sewing activities. Forty different clubs provide plenty of other activities, such as quilting, cards and fitness classes. There also clubs to cater to many interests such as wine, performing arts, and charity work. Heritage Park is located in desirable Sacramento, California. It is only ten minutes away from Sacramento International Airport. This makes it a perfect choice for people 55 and over from all over the country, as it allows them to stay physically connected with their children and grandchildren. The city of Sacramento offers many special events, which residents can enjoy. Some examples are the Sacramento Jazz Jubilee, Pacific Rim Street Festival, Gold Rush Days, Waterfront Festival, and Fireworks Spectacular. Sport enthusiasts love attending Sacramento Kings basketball games. During the winter season, nearby Lake Tahoe provides for great skiing and snow boarding. 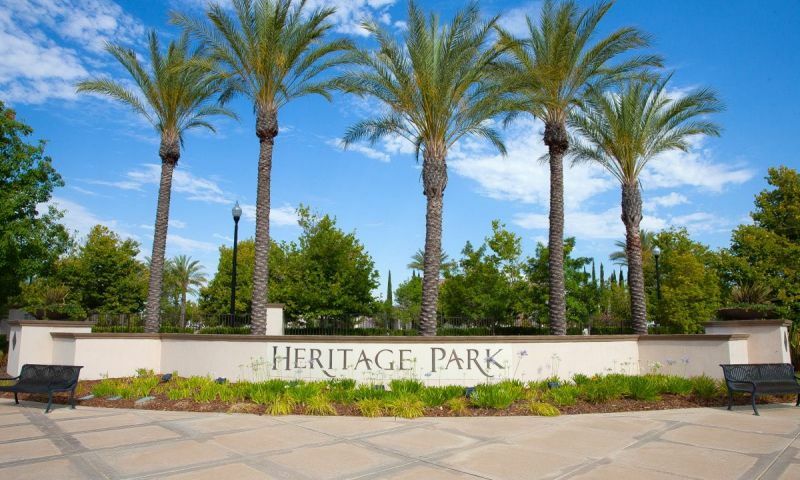 Heritage Park offers the ideal location that is close to shopping, dining, and entertainment near Sacramento, California. The Fireside Room is available for private parties. It is a small room off the clubhouse that has a fireplace, TV, and DVD player. There are plenty of activities available in Heritage Park. Here is a sample of some of the clubs, activities and classes offered here. The Coastal Collection are attached homes offered within Heritage Park. There are three models that range in size from 1,087 to 1,557 square feet. Homes offer two to three bedrooms, one-and-a-half to two bathrooms and a two-car garage. The Carribbean Collection features four floor plans that range in size from 1,297 to 1,797 square feet. These single-family homes feature two to three bedrooms, two bathrooms, and a two-car garage. The Riviera Collection offers five single-family models. These homes range in size from 2,005 to 3,264 square feet and feature two to four bedrooms, two to three bathrooms and a two-and-a-half to three-car garage. The Martinique Collection features five single-family floor plans that range in size from 1,662 to 2,830 square feet. These homes feature two to four bedrooms, two to three bathrooms and a two-and-a-half to three car garage. Most homes also feature a den which can be used as an additional bedroom. Amazing community!! Great clubs, friendly people. All that and a restaurant, pub, ballroom and so much more!!! My parents have been residents here since their opening. I have never seen them happier to be a part of a community, and a common well being. There is activities, and entertainment for every demographic. All of the neighbors welcome you with a smile, and if your lucky enough, you could be a part of what they live every day. My husband, Michael, and I moved here from the adjacent community of Natomas Park in 2005. We purchased one of the first re-sales in this community. We are extremely happy here, I guess most of all we love the sense of Community the pervades Heritage Park. There were 45 active clubs when we moved here, and now there are 66. If you enjoy something, and want to share it, you start a Club and THEY WILL COME! The possibilities for fun and connecting with others are endless! Quite a few of our residents are happily retired, and they love to travel, and we all love the fact that we are TRULY a 5 minute drive to Sac International, yet we hardly ever hear any planes overhead, because the flight path is quite a ways west of us. It's the best of both worlds! We also love the fact that we are only 7 minutes from downtown Sacramento, with such easy access to all of the restaurants, shopping and cultural events. My husband and I were a bit hesitant about moving to a "retirement" community but all our concerns were for naught. We moved here in 2004 and although at first we missed our old neighborhood of 36 years (20 minutes away) we have come to love this place just as much. Every community is different and it's important to find one that fits your needs. So read on, but I saved the best for last. COMMUNITY: The advantage of a small community (965 homes) is a real feeling of community. We don't have two or three clubhouses, instead we have one 25,000 sq feet clubhouse resulting in a central meeting place so you don't miss seeing anyone who is out and about. With indoor and outdoor pools you can swim year around or relax in one of the two outdoor spas. The pub-cafe has special events such as Friday night grill, Ladies night, Men's night, neighborhood-street nights, Solo night, etc. We also have over 50 clubs providing something for everyone. RESIDENTS: Great people! Many of our residents still work and we have a good mix of singles and couples. Some folks moved here from the Sacramento Valley area but just as many moved here from the Bay area and Southern California. The variety of past professions is astonishing and we are fortunate to have dedicated volunteers who serve on our Board and committees to ensure our community stays fiscally secure and remains a vibrant look-to-the-future place to live. DUES: Our HOA dues are a bit higher than some places due to a smaller number of homes supporting such a beautiful community. But our dues include front yard landscaping and maintenance and that makes it worth it. The dues for the duets also include house painting every seven years. 55places.com is not affiliated with the developer(s) or homeowners association of Heritage Park. The information you submit is distributed to a 55places.com Partner Agent, who is a licensed real estate agent. The information regarding Heritage Park has not been verified or approved by the developer or homeowners association. Please verify all information prior to purchasing. 55places.com is not responsible for any errors regarding the information displayed on this website.